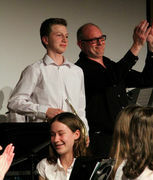 After having to postpone the concert from its original date due to the hazardous weather, our annual Act 1 Concert finally went ahead on Tuesday 13 March, allowing us to showcase the musical talents of St Bede's students. The large amount of students from all year groups who make up the choir, ensembles, orchestras, junior singers and jazz bands played to a packed out audience. In the first half of the evening the runners up from the 'Last Choir Standing' competition performed and after the interval a number of songs from our recent musical 'The Addams Family' were reprised. We were even lucky to have one of our visiting exchange partners from Germany, Jaron Akkermann, playing the French horn with the Wind Band. Thank you to everyone who came along on the revised date, we hope you enjoyed it as much as we did.